Unfortunately, not all dogs see a visit from the groomers as the pleasant experience it should be. Some dogs are incredibly uncooperative and – in some cases – aggressive, making the groomers job a near impossible task. Considering dog grooming involves the use of sharp scissors and clippers, the safety of both dog and groomer has to be the first priority. Aggression towards a groomer is usually a symptom of a deeper problem, that being that your dog doesn’t like strangers or being touched in certain areas. This is, in fact, good news! It means that difficult behaviour can be prevented by desensitising your dog; you can do this by socialising them with “strange” people and getting them used to being brushed and cleaned. This process starts in the first few weeks of having your new puppy – frequent brushing, cuddles and massages can greatly help in reducing anxiety surrounding touch. Once a day, simply massage their feet and get right in between the toe pads and nails. You can also massage their ears and (less frequently) start gently brushing their coats. Remember to always reward them for their good behaviour, whether that is with treats or through verbal praise. Try and keep the environment relaxed and calm and gradually lengthen the grooming period over time. Start off at 5 minutes a day, and as your dog gets older and more comfortable with being handled, increase the session length. Whenever you have visitors or are out walking your dog, it is also important to let other people show your dog the same level of affection. This will help socialise your dog with other humans and get them used to being touched by strangers. Another thing you can do to help your dog get ready for the groomers is desensitise them to loud noises so when it comes to blow drying they won’t fret. Don’t be afraid to play loud music, vacuum and mow the lawn while your dog is around. 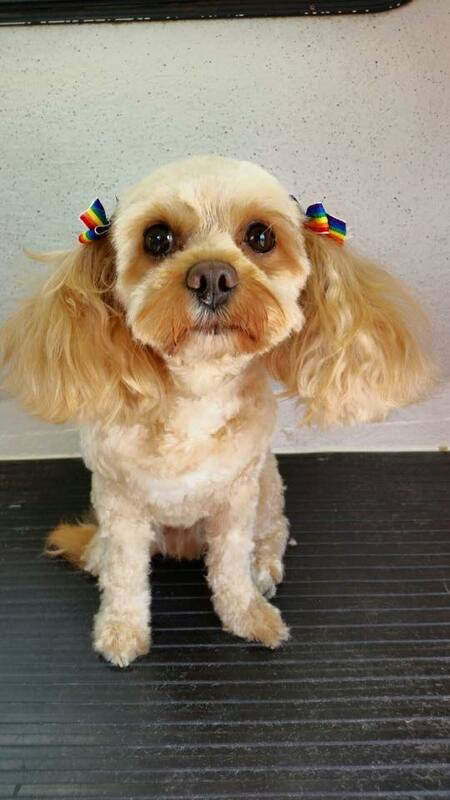 If from an early age you manage to assure your dog that grooming is an enjoyable and fun experience, you will have no problems when it comes time to book a dog groomer. After all, what’s not to love about a warm bath, blow dry and stylish clip? ‹ Dog Wash: DIY or Professional Service?